Corona is about to bring you the sexiest and smoothest of festivals! 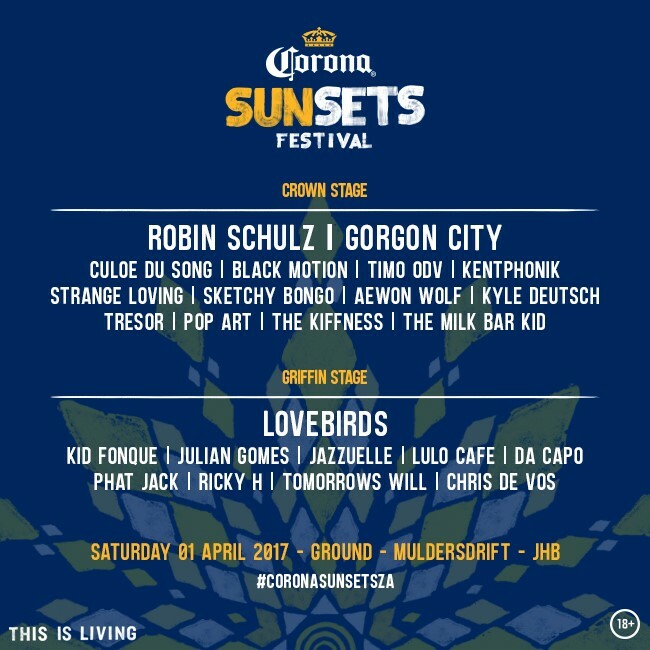 Hot on the heels of the Cape Town edition, Corona SunSets Festval is set to bring its magic to Johannesburg on Saturday, 1st of April 2017 at Ground in Muldersdrift. The Crown Stage will feature international guests popular German producer and DJ Robin Schulz and dynamic big bass electronic duo, Gorgon City from North London. Delivering sunset beats are local house music headliners Kentphonik, Culoe De Song, Timo ODV with performances by DJ and percussion duo Black Motion, Sketchy Bongo, Aewon Wolf, Kyle Deutsch, Tresor, Strange Loving, The Kiffness, Pop Art Live and The Milk Bar Kid. The Griffin Stage will host Berlin native producer and DJ, Sebastian Doering whose widely know under monikers Lovebirds or as deep house duo Kneedeep. Lovebirds harbours timeless contributions to long-standing deep house labels Freerange Records and Winding Roads Records with titles like ‘The Rat’, ‘Want You In My Soul’ and his most recent collaboration with Amsterdam based singer Stee Downs on ‘Love´s Like Dancin‘. Lovebirds will be alongside local deep house taste makers and upfront beat bangers Kid Fonque, Jullian Gomes, Jazzuelle, Da Capo, Lulo Cafe, Phat Jack, Ricky H, Tomorrows Will and Chris De Vos. Corona has given us access to the Johannesburg edition of the Sunset Festival, one lucky festival goer will walk into the sunset with 3 friends for an incredible Corona Sunsets Festival Experience. This global festival features more than eight flagship festivals and close to 4,000 events of various size and intimacy worldwide, celebrating the exhilarating transformation that takes place around the world at sunset. Mention @Houseonmag and three friends you’d like to walk into the Corona Sunset Festival with and tag #CoronaSunSetsZA to win.